Today we're excited to announce complete Google Apps support for Google Glass customers, including device and account management. Google Glass, also known as Project Glass, was released on a limited basis in February of 2013. It is essentially a wearable computer. Glass has an optical head mounted display that provides mobile computing. The main advantage of Glass is that it can be accessed in any environment and at any time. This device is efficiency personified. It is comparable to a smartphone in your glasses except it does not always require the use of one's hands. The Glass operator can use his hands on the trackpad but most commands are given verbally. Using Google Glass to access the benefits of cloud computing is the epitome of efficiency and peak productivity. Both represent the cutting edge of technological innovation. There are significant advantages to working on the cloud aside from the obvious practical benefits like increased storage space and unified correspondence. Clouds allow collaboration between users through file sharing and simultaneous user modification capabilities. This also presents the opportunity for customers to interact with a business's staff and Google Docs. Why schedule an in-person meeting or send a bulky file to a customer when he can access the data on the cloud? Web-based software also leaves room for perpetual innovation. This means that the Google Apps programs can be updated on the fly, over time without extra expenses. Cloud users will be able to access upgrades without having to learn the “ins and outs” of a new product line or purchase new variations. One of the most important advantages of using clouds to compute with Google Glass is that the data is available anywhere at any time on any platform and device. 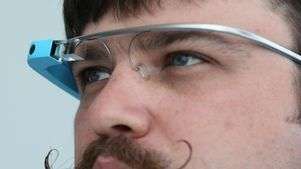 It is much easier to tap your Google Glass than it is to start up programs on a slow and bulky computer. It is clear that both Glass and Clouds were designed with the user's experience in mind. Google Glass provides easy mobile access to Google Business Apps. Access Gmail through Glass to read, send and sort messages. Check out Google Drive which provides online storage with combined 30GB. This space is shared between Google mail and Google Drive. A business's Google Apps Administrator is able to allocate even more cloud storage if desired. Up to 16 TB's are available. Glass also provides access to Google Docs which allows unparalleled document collaboration by letting multiple users to simultaneously modify and create pieces of a shared document. This provides maximum utility, efficiency and productivity. Businesses also use Glass for Google Slides. Slides allows people to work together on presentations instead of forcing them to work alone with the outdated Powerpoint software. Glass is also used to access Google Spreadsheets which permit an unlimited number of users to enter spreadsheet data through a unique harmonization of Web Form integration with Google Apps. Glass will allow an entire business team to coordinate their schedules through Google Calendar. This program allows each team member to access his teammate's itinerary in order to maximize efficiency. Want to find out if the conference room is occupied at 2:00 PM on the 31st? Just use Glass to check your colleagues' schedules. Contact Coolhead Tech to join thousands of local businesses that use Google Apps to improve their organization's efficiency and functionality. Better yet, combine Apps with the breakthrough technology of Google Glass to maximize your business's efficiency and profitability. Coolhead Tech provides business solutions for companies that operate “In The Cloud”. We offer Google Apps for Business including but not limited to Google Drive, Gmail and Google Calendar. We also provide support for organizations through Cloud software with Hubspot Inbound Marketing, Freshbooks Cloud Accounting and Cloudlock.